[0:08] <Chase__> CoJaBo: so what the i/o error stuff from, the computer you were using to write on the sd card? [0:24] <[Franklin]> just wanna know: is running a rpi as a production web server a good idea? as in, how stable is it? [0:27] <[Franklin]> nope... to pay for the power! [0:29] <[Franklin]> so will it use more power with the litecoin miner? [0:32] <niston> unless youre located in the middle of a desert where the sun glares down unhindered. but then you'll need even more power for cooling. [0:33] <theCzar> PhantomS: my guess: a long time. I used to mine litecoin on a beefy machine (I didn't have to pay for power) and only averaged one litecoin per every week. [0:34] <[Franklin]> alos, is it safe to run 24/7 rpi? [0:34] <[Franklin]> so pool maybe? [0:34] <[Franklin]> and risk of sparks on CARPET? [1:08] <xreal> I need a 56k modem for my Raspberry. Is there a small shield or something? [1:09] <xreal> SpeedEvil: So I need a usb-2-serial adapter to drive my old acer modem? [1:16] <xreal> SpeedEvil: the problem is, these are "soft modems". [1:16] <xreal> SpeedEvil: Everything is done in the drivers... not like the old modems, which are hardware. [1:16] <SpeedEvil> xreal: I'm just going by the fact that it says linux. [1:17] <xreal> SpeedEvil: I'll stay with my old Acer. You simply can open UART and you're done. [1:17] <ksx4system> anyone tried zd1211 WiFi card on openSUSE? [1:18] <SpeedEvil> Are you sure it's not the cable? [1:20] <SpeedEvil> witch battery is not acceptable - they are just perfectly normal members of the community with odd beliefs. [1:23] <Mr_Sheesh> I'm just wondering which battery they're using to run an RPi; I have a project that will use an RPi that'd be battery powered. [1:23] <SpeedEvil> how long for? [1:30] <CoJaBo> Which ones are there specific for the pi? [1:35] <Mr_Sheesh> I know for certain I could "diode steer" power from a battery charger to run the RPi + just charge the battery, anyways. [4:23] <phire> So, the pi doesn't support floating point textures? [4:25] <phire> oh, 16bit float textures are supported? [4:40] <abnormal> what? what did you buy? [4:53] <abnormal> but kids have to go to parents and say mommy, daddy can I have a pi kit? [4:54] <abnormal> why, are you Eben? [6:21] <abnormal> is that all is going on here??? just everyone changing nicks??? might as well call this channel "nickchanger"
[8:49] <abnormal> that is beyond my knowledge. sorry, there is one guy I know that is rpi guru, and is lost_soul and comes in once in a while... usually evenings. [8:50] <abnormal> would this help? [8:54] <gordonDrogon> why do you need an RTOS, RahulAN ? [9:06] <gordonDrogon> ok. well enjoy. [9:25] <Mr_Sheesh> You want to, what, turn an LED on or off, but it's powered by 12V? [9:26] <Mr_Sheesh> DoctorD90 - OK, is it a high current LED or just a regular one? 20mA or 5A in other words? [9:27] <Mr_Sheesh> idk what that is yet? My web browser's over loaded too. 12V light strips but how much total current? [9:30] <Mr_Sheesh> Oh, OK, WWS2801's :) IIRC those are a 1-wire protocol? [9:33] <LilBuh> think it ll do the trick ? [9:36] <Mr_Sheesh> Browser is eating most cpu tho, mumble. May take a while, What does the TIP20 do in that circuit? Are those just turning power LEDs on/off directly? [9:48] <LilBuh> and what bout the common ground ? is that a problem ? [9:59] * SpeedEvil yells 'Ground is a lie!' and goes back to sleep. [10:04] <LilBuh> mmm how could i draw the shematics to show you if i got everything right ? [10:31] <[Saint]> Approximately 400 anybodies. [10:32] <[Saint]> Just ask your question, if someone can, they'll answer. [10:49] <d3lphi> Hello all. I am using Raspbian (latest version, up-to-date) and would like to use my RaspberryPi for showing a website in kiosk mode. Therefore I edited /etc/xdg/lxsession/LXDE/autostart and commented out the three first lines (starting lxpanel, pcmanfm and xscreensaver). [10:49] <DJHenjin> gordonDrogon: well,.. what can i expect to get? [10:50] <gordonDrogon> DJHenjin, what are you actually trying to achieve? [10:50] <d3lphi> how can I give an operator/user the opportunity to safely shut-down the RaspberryPi? When he presses CTRL-ALT-DEL he doesn't get an option to shut it down. [10:51] <gordonDrogon> DJHenjin, there are 2 hardware PWM generators. Use those. 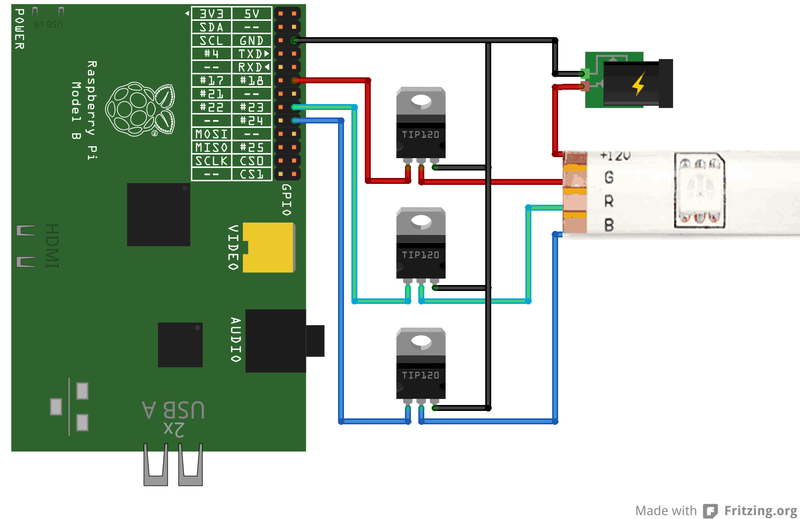 [10:52] <gordonDrogon> d3lphi, separate button wired to a gpio line - with a little program to check the button then halt the pi? [10:53] <gordonDrogon> DJHenjin, best to get & read the hardware manual - but you can feed the PWM generators from any of the Pi's clocks - it's fed from the 19.2MHz one by default. [10:53] <DJHenjin> would there be a link? [10:54] <gordonDrogon> also bear in-mind that "frequency" and "pwm" do not have a 1:1 correlation. The actual frequency will be dependant on the size of the pwm range register too. [10:56] <DJHenjin> and of cycles fully complete in 1 second, and duty is % of 1 cycle that it is in on state is it not? [10:57] <Mr_Sheesh> frequency is how often the PWM is turned on and off, the % duty cycle is how many % (of 100%) that the PWM is "on"
[10:58] <gordonDrogon> the time-slot time is determined by the frequency of the input clock. [10:59] <gordonDrogon> it's slightly more complex in the Pi as it has 2 PWM modes - classic mark:space and (the Pi's default) which is a balanced mode where it balanced out the 1's and 0's over the whole wave period. [10:59] <gordonDrogon> the net effect is the same, but the output frequency changes. [11:02] <DJHenjin> does the pi have high resolution timer support, or is the resulution only millisecond? [11:02] <DJHenjin> how about nanosecond? [11:02] <gordonDrogon> but do bear in-mind that on-top of that you have a multi-tasking, multi-user operating system. [11:04] <d3lphi> gordonDrogon: cannot I just say that CTRL-ALT-DEL should not start the task manager, but "shutdown" the system? [11:04] <d3lphi> or define a new hotkey for executing a command like "shutdown -h now" ? [11:04] <gordonDrogon> d3lphi, possibly, but I've never looked at that sort of thing in lxde. [11:04] <d3lphi> where do I configure that? [11:05] <gordonDrogon> I suggest googling for lxde configuration. [11:05] <gordonDrogon> DJHenjin, have fun! [11:38] <Mr_Sheesh> that pulls the line up to +12V unless the transistor is turned "on"
[11:40] <gordonDrogon> ws2801's run at 5v. [11:41] <gordonDrogon> it should be possible to drive them directly from the Pi's GPIO without transistors though - I'm sure I've seen people just hook up to the SPI port. [11:44] <gordonDrogon> I'm not convinced myself - the ws2801 really is a 5v part. [11:45] <gordonDrogon> intersting little boards - that you have to wire up each one yourself. you can get these on tape though. [12:01] <lilbuh> so what do you think ? i wire everything in 5v ? [12:08] <Mr_Sheesh> Try the WS8201 with 5V, see if it lights up properly? [12:11] <Mr_Sheesh> You could also ask the seller if it is indeed 12V; could be intentionally set up to use 12V ofc. [12:13] <SpeedEvil> http://www.bbc.co.uk/news/world-europe-29105635 - a massive achievement in germany. [12:18] <RoBo_V> Afternoon Guys ! [14:08] <DoctorD90> from led on rpi b+, how can i understand when rpi has started and ready to accept ssh/vnc/and make other option? [14:11] <pksato> on board led? [14:12] <pksato> none of can have this information. act stoping are good clue. [14:16] <pksato> connect leds on gpios, and a program to monitor if some process is runing, and on of off led. [15:13] <IT_Sean> oh poop indeed. [15:20] <d3lphi> I tried quiet everything and don't know why on the first start of Midori this is happening and how to fix. Any clues? [15:21] <IT_Sean> network not yet up and running? [15:22] <IT_Sean> try waiting 30 seconds then opening the URL... see what that does. [15:26] <d3lphi> IT_Sean: I couldn't explain myself, why the network should be not ready. I double-checked quite everything in /etc/network/interfaces and it seems all valid. [15:38] <skyroveRR> Hello, I don't have a dupont connector, but I still would like to connect my raspberry pi to a PL2303 USB converter, after connecting the TX, RX and GND wires to the pi and launching minicom, all I see is garbage, I also turned off h/w and s/w flow control and set the bits to 8N1, still I get the garbage output, and suggestions on how to solve this? [15:40] <shiftplusone> what baud rate? [15:40] <skyroveRR> * suggested. Sorry. [15:44] <skyroveRR> Got it! got some output. [15:45] <skyroveRR> I'm actually trying to troubleshoot why slackware ARM won't boot up on the card. [15:45] <leio> maybe it's build for ARMv7? [15:45] <skyroveRR> No, for v6. [15:47] <skyroveRR> It IS built for the pi. [15:48] <skyroveRR> The site says that it will work for B+. [16:05] <skyroveRR> The baud rate is 115200, and slackware doesn't do things automagically for its users, shiftplusone . [16:08] <shiftplusone> But there's nothing automagic about changing the baud rate. It's almost an arbitrary value and the only reason they'd pick 115200 would be to be consistent with the rest. I'll take your word for it though. [17:48] <coldjack> How long does it take to get the license for mpeg2? [18:03] <kill_-9_1> Hi. Is there the docs for DPI( the VGA board uses that)? [18:09] <Tachyon`> DSI? that display interface we never got any support for? [18:09] <kill_-9_1> Tachyon`: DPI. Another one which has support in the blob. [18:10] <Tachyon`> it's a DSI connector I thought, can it do anything else? [18:13] <shiftplusone> Tachyon`, when they announce what they're working on, people complain that it's not ready yet. When they release without talking about earlier, people complain that they weren't told. [18:51] <MY123> IT_Sean: or the ABC feature phone keyboard. [18:52] <IT_Sean> MY123: I hate the ABC feature phone keyboard. [18:53] <MY123> IT_Sean: Like me. I use it only to tap phone numbers. [18:55] <MY123> DoctorD90: Install the Oracle JVM and just run the jar. [18:56] <DoctorD90> uhm.....thx! i will check! [18:57] <DoctorD90> to install oracle jvm? [18:57] <DoctorD90> what packages is? [18:59] <DoctorD90> ok, so i have only to lunch some java files :P thx! [19:01] <MY123> DanDare: OpenJDK is way too slow... Oracle did better. [19:03] <MY123> DanDare: Do a apt-cache search oracle-java in a Raspbian system from NOOBS. [19:42] <unimatrix9> any tweaks to speedup web browsing on the py ? [19:42] <MY123> unimatrix9: Using Epiphany. [19:43] <MY123> SpeedEvil: I use elinks when possible. [19:47] <MY123> unimatrix9: sudo apt-get dist-upgrade && sudo apt-get install epiphany && epiphany-browser in the terminal. [19:49] <MY123> unimatrix9: Does the videos work? [19:49] <unimatrix9> no not really, i am using an other way around the video problem ..
[19:52] <unimatrix9> wich works fine..
[19:55] <Perdouille> Does anyone know if it's possible to upload a .mp3 file to a web page, then listen the mp3 directly on the raspberry ? [19:56] <unimatrix9> for the little machine ? [19:57] <unimatrix9> is this because of the "closed" source chip on the board ? [19:57] <unimatrix9> and , why can omxplayer use the 3D accel , and X not ? [20:00] <unimatrix9> have a nice meal..
[20:00] <unimatrix9> then you can eat and listen to the mp3 ..
[20:01] <unimatrix9> i think apt-get install sonata , gives you a player, but i am not sure ..
[20:02] <MY123> unimatrix9: There is a KMS/Gallium3D driver in alpha (OpenGL 2.1). [20:03] <unimatrix9> MY123 url ? [20:04] <Jgar0605> did it fry a connector pin. [20:09] <unimatrix9> i think the raspberry pi can be cool , if an when , the software that runs on it is especially build for optimum speed and use of the device , wich at the moment , really is not..
[20:10] <MY123> unimatrix9: Can you write assembly code(or C)? [20:11] <unimatrix9> a well, its been around since 2012, so it needs time to get it up to speed..
[20:12] <MY123> unimatrix9: There is an additionnal CPU on the Pi (dual-core but sadly without MMU). [20:15] <unimatrix9> how do you get system info from pi ? i tried lshw , but that does not give much ..
[20:18] <MY123> unimatrix9: lshw can't give much. Most of the SoC is accessed with RPC from the ARM to the dual-core CPU. [20:20] <unimatrix9> ah the video is indeed dual core ..
[20:27] <unimatrix9> thanks for the info ..
[20:30] <unimatrix9> i see you really care.. would be great if some more people get to work on it so it runs better and better..
[20:34] <unimatrix9> any way .. got to go, thank you for the good chat, and take care , have a nice day ! [20:47] <mapps> how can i make the wireless start on boot? [20:51] <gordonDrogon> that works for me. [20:53] <Tachyon`> I think if you're using anything more than open/wep you need more than just /etc/network/interaces don't oyu? [21:06] <mapps> gordonDrogon, for wifi? [21:06] <gordonDrogon> wpa2 works just as well. [21:06] <gordonDrogon> you need the right runes in /etc/network/interfaces, but once setup it works great. [21:06] <gordonDrogon> hang on - I'll boot up a Pi with Wi-Fi and get the details. [21:08] <gordonDrogon> runes - google it. [21:11] <gordonDrogon> and that's all there is to it. Obviously use DHCP if you need it, or change the IP address to one on your own LAN. [21:19] <pksato> if is wpa_psk, yes. [21:24] <jbaiter> is somebody here familiar with gpu programming/omx/mmal on the pi? [21:43] <gordonDrogon> Perdouille, oh yes - there's a school that was showing this off at the last CamJam too I think. [21:46] <InHisName> I try to use wvdial and it aborts saying can't find ppp0. I see TONS of people have that same issue but few solutions to try. Most are unanswered. [21:53] <DanDare> InHisName, do you have a modem attached to pi? Is modem recognized, kernel modules loaded etc ? [22:17] <InHisName> DanDare: I believe so. Its a 4G/3G dongle, it thinks it is a modem and talks via AT commands. It shows up in lsusb. [22:21] <InHisName> DanDare: /dev/ttyUSB0 <-- is that it ? [22:22] <InHisName> Supposedly. The web page with sprint has steps and all is well until I get to the can't find ppp0 step. [22:23] <DanDare> InHisName, probably, do you have anything else attached to USB besides the dongle? [22:24] <InHisName> They mention that but give no steps. Maybe its too easy to list steps. [22:47] <DanDare> Now, my pi is hang... remotely!! [22:49] <IT_Sean> 700mA is not enough to run a Pi. [22:49] <IT_Sean> the absolute minimum requirement, as per the specs, is 750mA. 1A or more is highly recommended. [22:50] <IT_Sean> and on that, my day is coming to a close. Bye.